If you are in the market for the services of a top-rated motorcycle accident attorney in Escondido, CA, contact the Rawa Law Group. When you hire Rawa Law Group as your legal counsel, we put in all the effort and our legal might to see your case to fruition with the desired result. It’s noteworthy that our firm has some of the topmost law practitioners in California and our lawyers have over 50 years of combined legal practice. At Rawa Law group, we strive to deliver the utmost best legal representation to our clients with the hope that your desire for a meaningful compensation after your motorcycle accident is fulfilled. Our firm is a superior 5-star practice which has some of the best personal injury lawyers in California at your beck and call. We have a team of dedicated attorneys that are relentless and have strong advocacy for the injured. 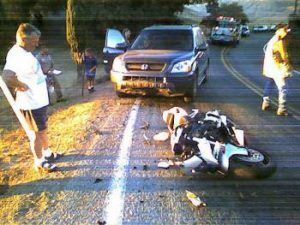 Having one of our lawyers represent you as your motorcycle accident attorney in Escondido almost certainly guarantees that your legal tussle would end with you being awarded the maximum compensation allowed. With lawyers who are not only renowned for their legal prowess but also their personable nature, you can be sure that your case would be given utmost importance and a distinct, personalized representation. Our zero initial deposit and our resolve to only be paid when we have fully delivered on our promise to get you your compensation should keep your mind at ease, as you have nothing to lose. Contact us at Rawa Law Group today.